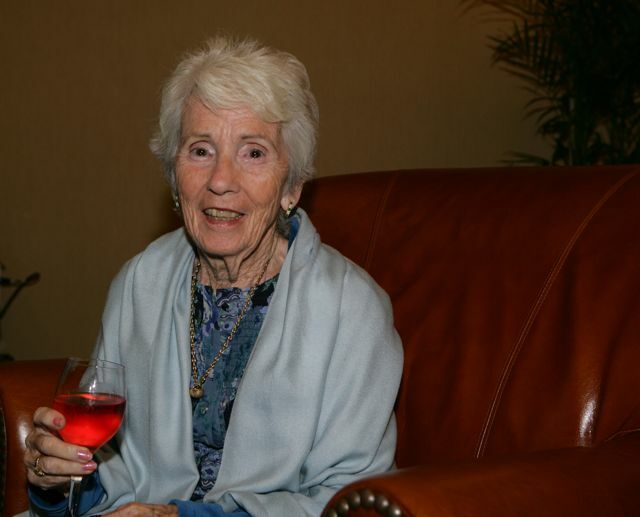 Posted December 15, 2011 It is with great sadness that we report that last night we lost a dear, dear friend, Mary Coe. 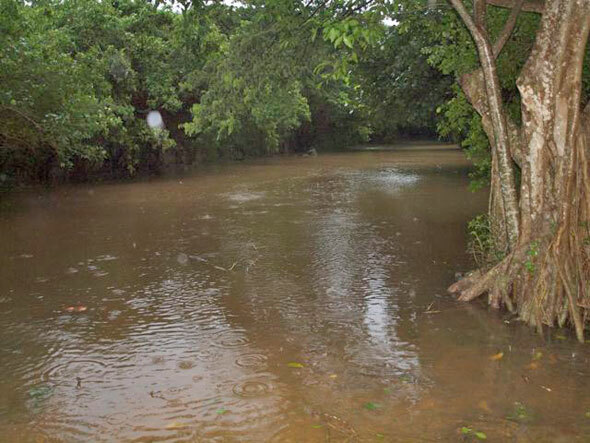 Mary succumbed to a long-term illness at her home here on Water Island. 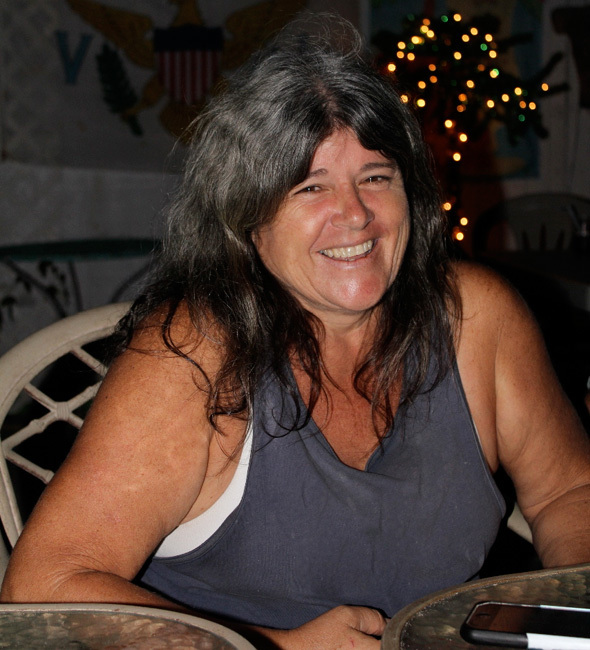 Mary was a longtime resident of Water Island along with her husband Randy. 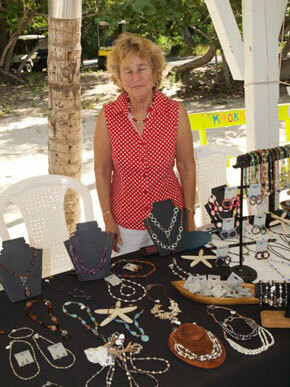 Mary was a friend to all and to many was the face of Water Island. Please post your remembrances of our friend Mary HERE. 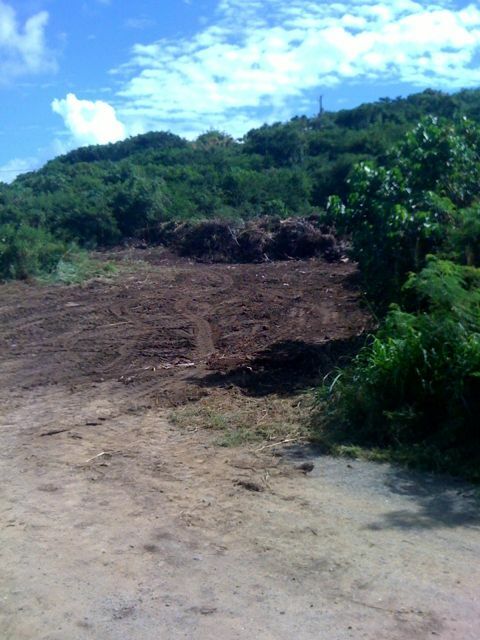 Posted December 7, 2011 WICA has paid to have the brush pile cleared so that ALL homeowners on Water Island have some place to put their brush when caring for their property. Please put your brush as far back from the road as possible when dumping. 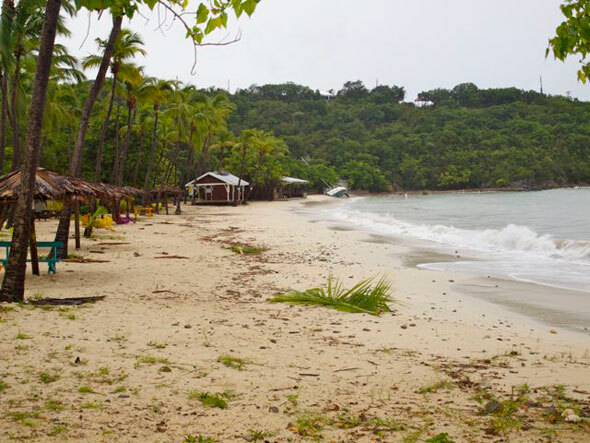 Commissioner St. Claire N. Williams of the Department of Housing, Parks and Recreation advises all tour and boat operators who operate or are planning to conduct tours or excursions to Honeymoon Beach on Water Island should register and make arrangements with the Department of Housing, Parks and Recreation for the use of the facility. 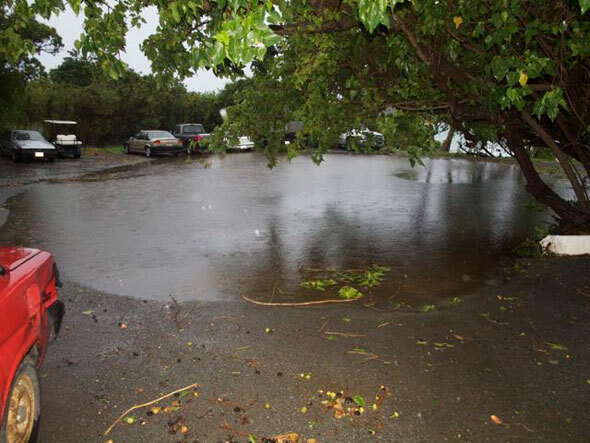 Williams noted that the infrastructure at Honeymoon Beach is limited and constant and excessive use of the facility by groups must be coordinated in order to provide for adequate maintenance to insure the health and safety of residents and visitors alike. For more information, please call DHPR at 774-0255. 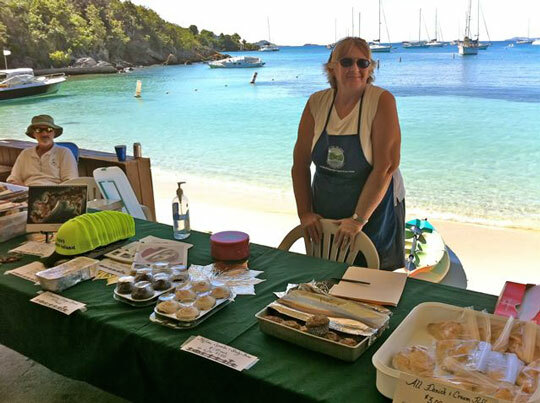 Posted December 6, 2011 This past weekend saw the many talented vendors in the Virgin Islands offering their crafts to anxious Christmas shoppers. 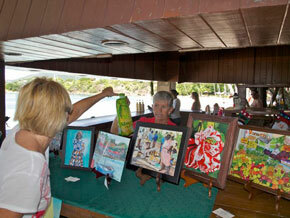 The event has become an annual tradition and continues to draw more talented artisans (many from right here on Water Island!) and more shoppers! With Christmas music playing in the background it was very easy to get into the Holiday spirit, sans snow. Posted November 28, 2011 Another Holiday Season is upon us on Water Island and to kick off the festivities Mr. & Mrs Santa Claus (aka Bob & Joanne Bohr) opened their home to all for the yearly tradition of the "Lighting of the Tree". This has turned into the official start of the Holiday Season for all Water Islanders! Santa, ehh, Bob, had a little more difficulty reaching the very top of the tree this year as it had grown substantially from last year. With a mighty effort he reached the top. 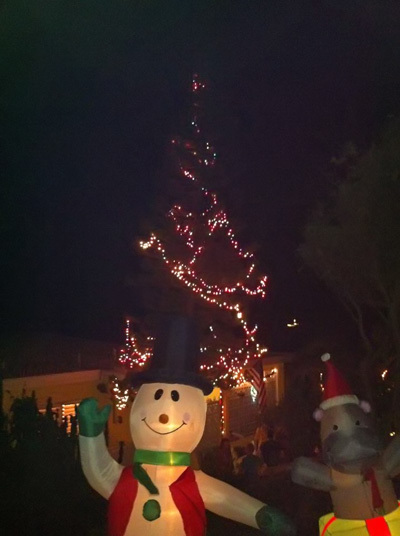 At precisely 7:00PM North Pole Time the switch was thrown and the tree came to life along with a couple of visiting snowmen! Mrs. Santa, ahh, Joanne, was in a festive spirit and made sure all of the good little boys and girls on Water Island had plenty of refreshments. This was quite an accomplishment since Bob & Joanne had just arrived back to Water Island from the North Pole (read- New Jersey) in the afternoon! Thanks to Hannah Cutler for the photo commemorating this tradition! And You Thought Wildlife On Water Island Was Interesting! "Honey! 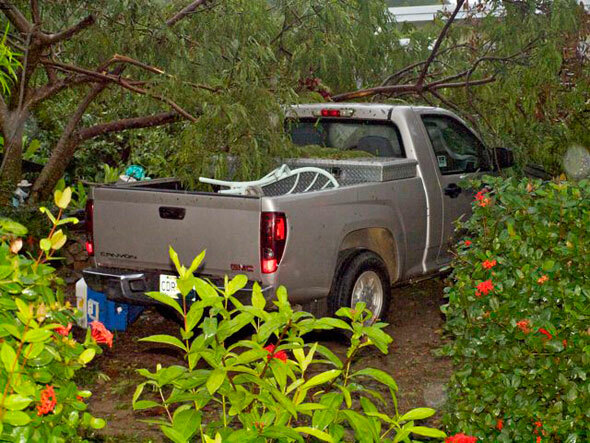 We might want to keep the kids inside today." 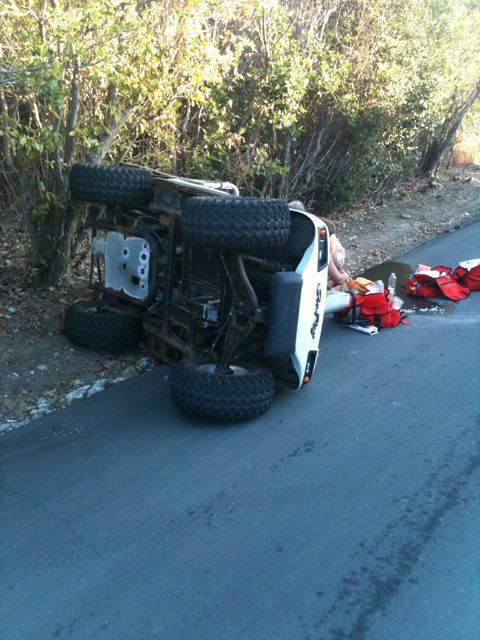 Posted October 27, 2011 Sent to us by our good friends Terry & Judy Learmont at their new home in Arizona. 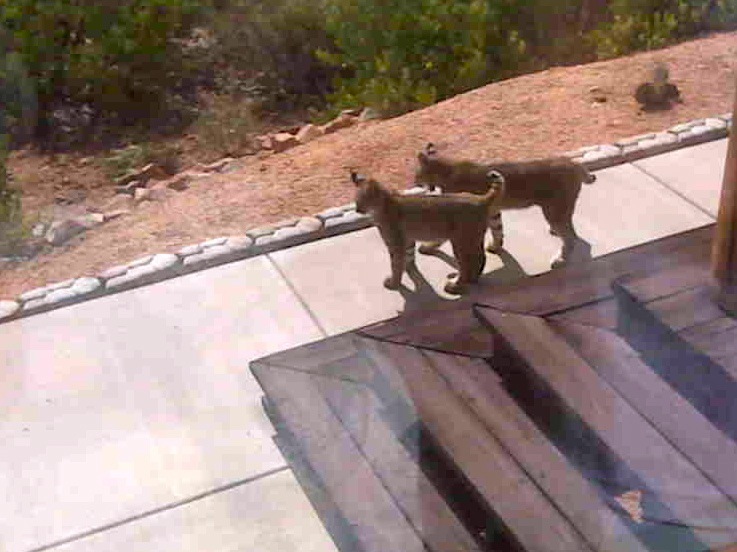 We bet they cannot wait to get back to Water Island after seeing these 2 Bobcats out on their deck yesterday! Through the efforts of many people WISAR received funding from the VI Government to help purchase an Emergency Medical Transportation Boat for WISAR as well as operational funding. 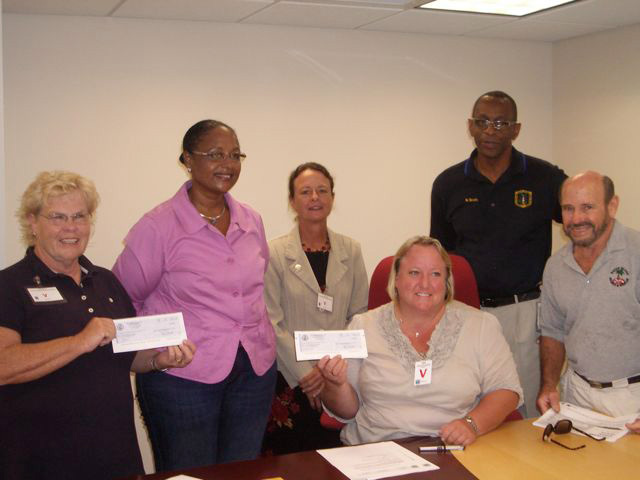 Accepting the checks for WISAR are Jeannine Mydlynski, Tom McCoy and Joanne Bohr. I have had several inquiries as to the date of the next meeting. At our special August meeting we voted to change the September meeting to Sunday, October 30, in the hope that some of our seaosnal members would be back on Island. If you have any Agenda items for our next meeting, please forward them to me. 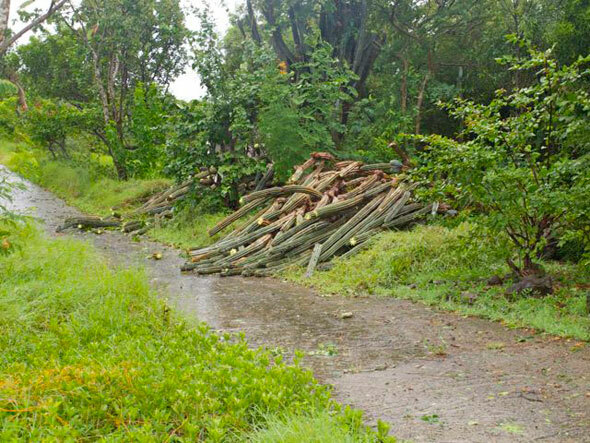 Posted August 22, 2011 Electric is out but WAPA is working on it. Strong winds, 60 70mph?, lots of rain but it appears to be little damage. I just wanted to get this up so the folks that are not here know that Water Island has survived...again! Now THIS is Being a Good Corporate Neighbor! 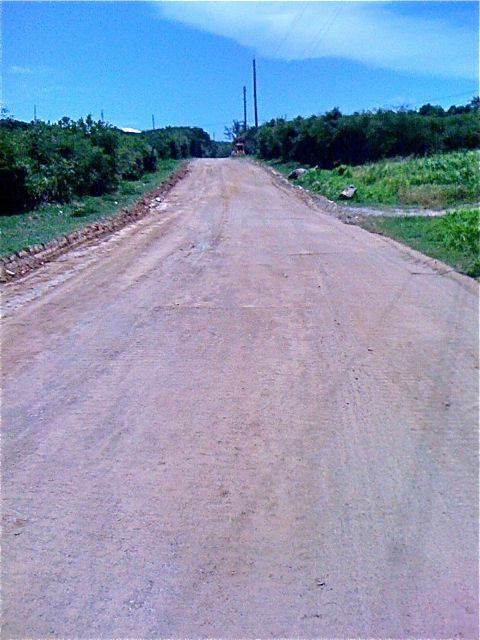 Posted August 11, 2011 Ken Floyd, of VI Paving, sent his men back over to repair potholes and strengthen some areas that were previously paved. VI Paving also installed the guardrail at the four corners intersection. 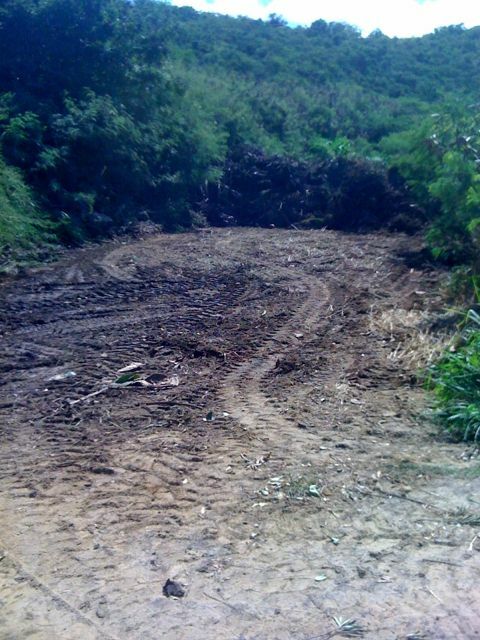 Additionally, Ken will have his road grader work on the dump road (this will have to wait until we have some rain as the road is currently too dry). 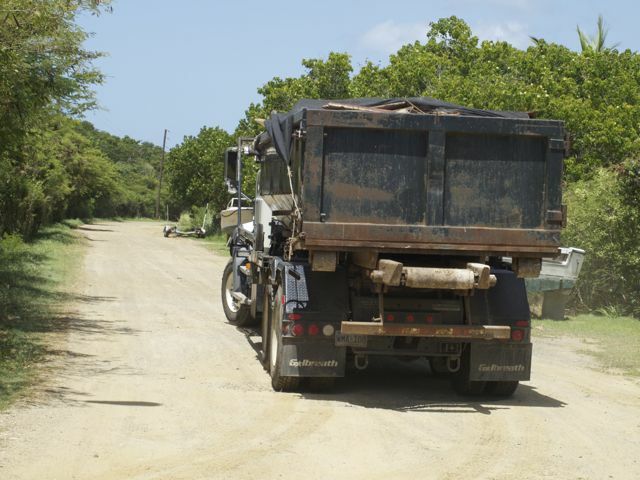 Ken and VI Paving are performing these tasks at no cost to the VI Government or to WICA (other than WICA paying for the barge). Ken volunteered VI Pavings services as a "good corporate neighbor" and we surely appreciate his efforts. When you see Ken or Elana, thank them for their effort to make Water Island a better place to live. Thank you Ken and thank you VI Paving! We appreciate your work! UPDATE August 18, 2011 - Ken and his crew did a very nice job grading the dump road today. Remember all those foot deep potholes? Thanks again Ken!! 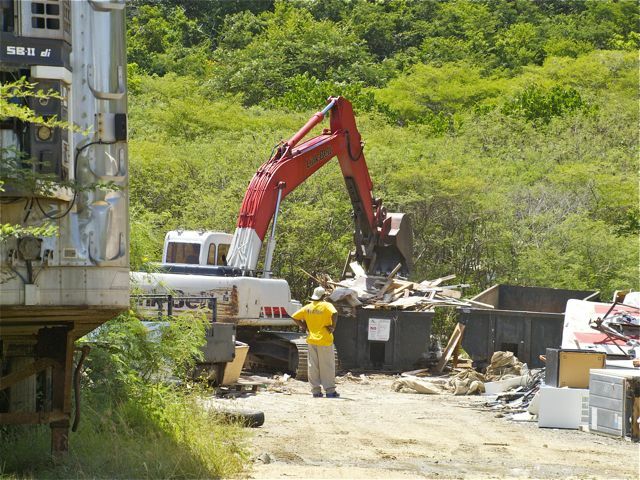 Posted August 9, 2011 The white goods and construction debris that has been laying at the waste transfer site for months is being cleaned up by the Waste Management Authority. The construction debris and white goods had accumulated so much that it became difficult to take household trash to the dumpsters. 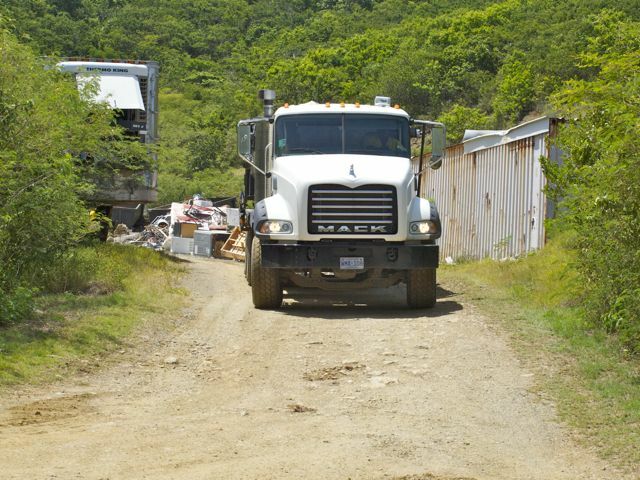 With the extraordinary effort by Barbara Petersen, the Water Island Administrator, and Joanne Bohr, the WICA Government Liason person, Waste Management Authority arrived on Water Island today and began the much needed cleanup. 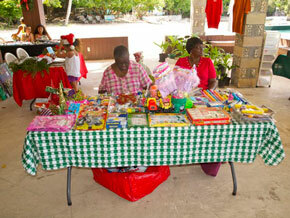 A heartfelt "Thanks" goes out to Barbara and Joanne and the Waste Management Authority. Thank You! 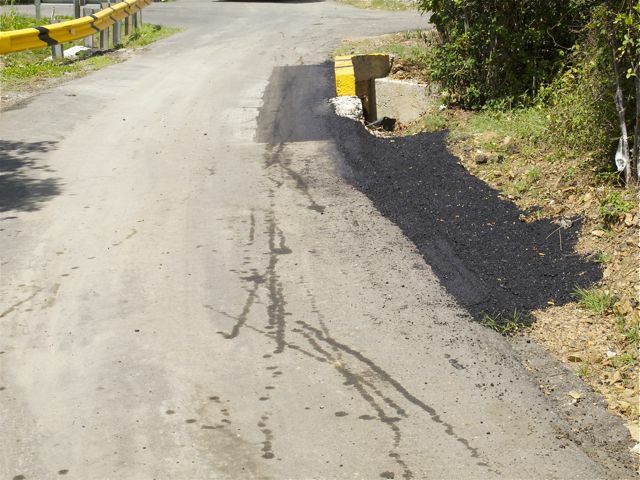 Posted July 29, 2011 The Department of Public Works was on Water Island several times this week doing much needed repair on some potholes! 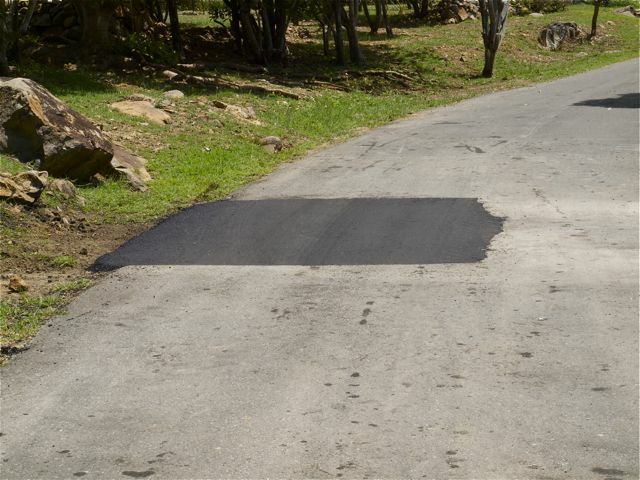 The Public Works crew used 15 tons of asphalt to repair the potholes on the upper half of Fort Hill Road and the Overdown road. Thank you Public Works! 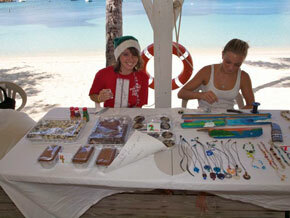 Posted July 14, 2011 The youngsters on Water Island sure know how to spend their summer days! 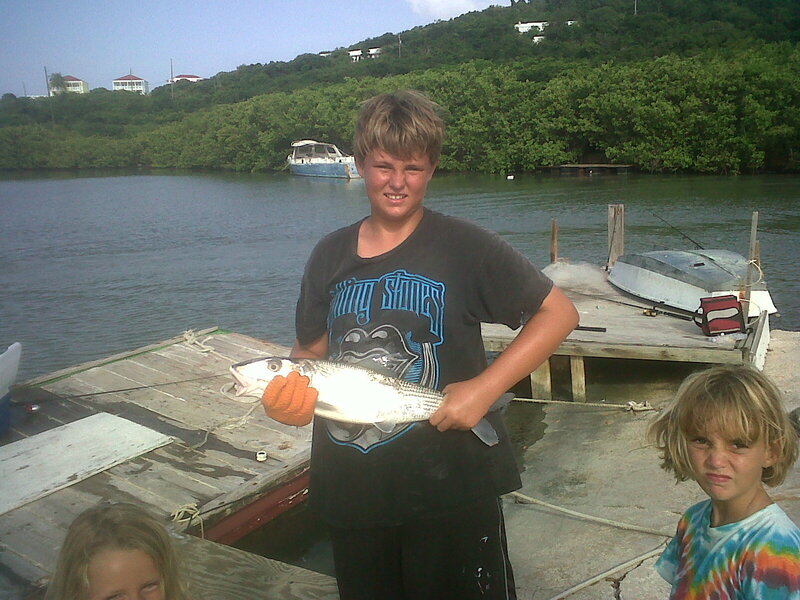 Here is Art LaFranchise showing off a beautiful catch he landed at Flamingo Bay. Looking on is Amanda and Ayla. Nice job Art. We are expecting to see you on the Deadliest Catch or Long Liners pretty soon! Posted July 5, 2011 There were few but they were mighty! Fewer people than normal were on Water Island for the 4th of July parade this year but the ones that were here made the parade a success. Beads and candy were thrown out to the huge throng of spectators that lined the parade route. Click HERE for more pictures. The Roadside Crews Are Here! 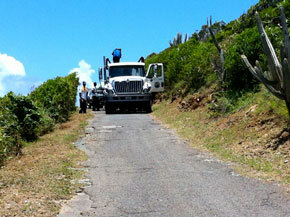 Posted June 28, 2011 The Roadside crews are back on Water Island! 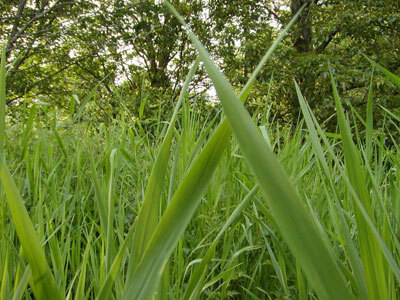 The timing is perfect as the recent rains have helped the grass and brush just sprout right up. They will probably be here for 4 - 6 weeks because of the height of the growth. Please remember to beep your horn as you are approaching a work area and also thank the guys and girls for doing such a great job! Talk About A Honey Of A Mess! 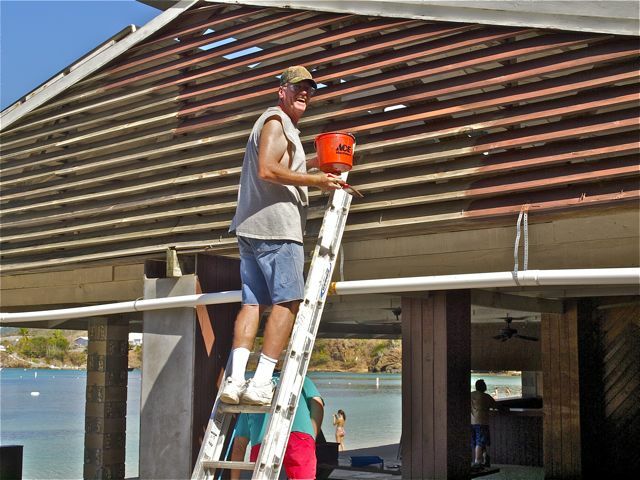 Posted June 20, 2011 The restrooms at Honeymoon Beach had become a "hive" of activity thanks to a large beehive located between the outside and inside walls! Thanks to Jurgen Bitterwolf and Mr. Berry, two professional bee enthusiasts, they were able to safely remove the huge honeycombs and bees and remove them from Water Island. Thank you Jurgen and Mr. Berry! Hey Look! There Is Water Island! Posted June 12, 2011 If you would like a live view of what surrounds Water Island click on the below link! Thanks to Jami Koenig of Flamingo Point we are able to offer a live view! flamingopointusvi.viewnetcam.com and type in "flamingo", for User Name and then "pointusvi" for the password. Click on the tab titled "Single" and choose from the preset options on the left hand side of the screen! Posted June 1, 2011 The next Wica quarterly meeting will be held at Shaffer Hall, Sunday, June 19, 2011 at 9:00AM. Hope you all can make it. If you would like any items for discussion on the agenda, please forward them to me. The Flags Are Back Up! 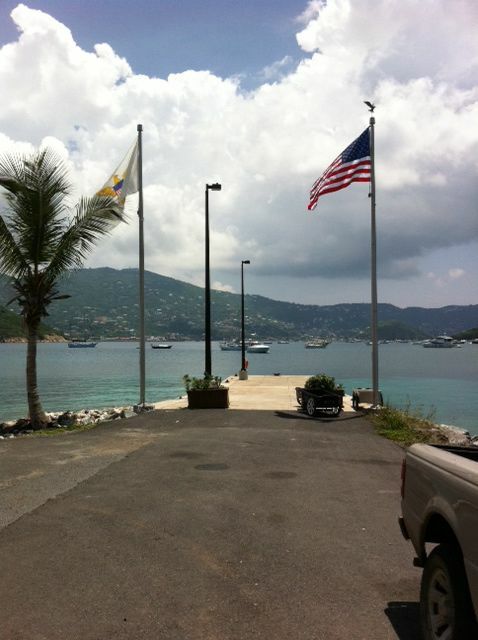 Posted May 27, 2011 Thanks to the efforts of Randy Coe, WAPA, Wally Henshaw, Joanne Bohr and the Water Island Civic Association, the flagpoles have been repaired at Phillips Landing Ferry Dock and the FLAGS ARE BACK UP! *****Lucy Gidley was taken back to Rhode Island for medical care and to move into her new suite of rooms adjoining my sisters house (Sue Holland). With great luck she will be able to visit the island again, but she will never be able to live here again. 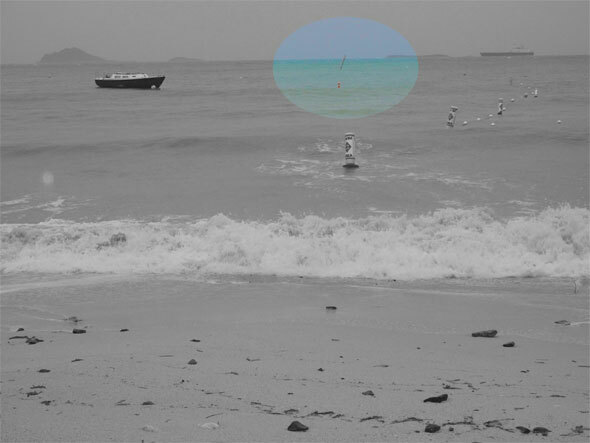 After 32 years on island, you can imagine how hard it was to take her off island. 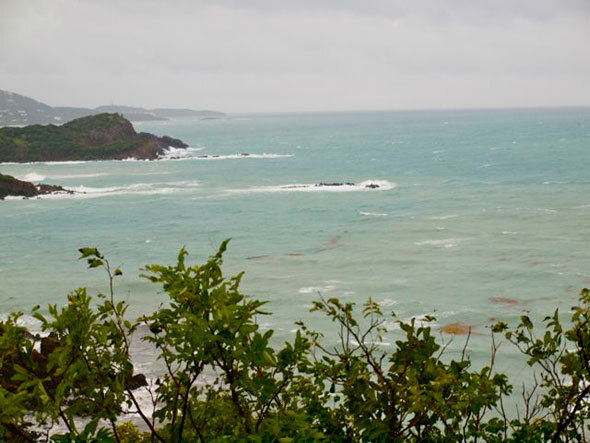 Lucy and Norm vacationed on Water Island during the early 1970's and purchased the house in 1978. They moved into the house in 1979 and proceeded to fix it up over time. 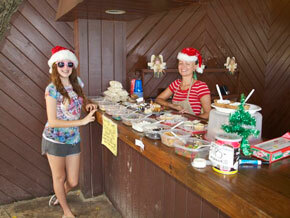 They enjoyed the people on the island and had great times with the early residents. Among them, the names of Meyer, Pond, Starr, Robertsons', Pearsall, Learmont, Blosser, Brister, Ford, Shafer, Randall, Hume, Wigdon, Jaconet, Cheeseborough, Peyton, Hill, Bubb, Henshaw, Coleman, Cantella, Shea, Herline (sp), Phillips, Stranahan, Zelley, Wigton, Alexander, Donovan, Bauer, Meding, Krigger, Shipman, Turton, Schneider, Stone, Kheller, Bate, and Auer, and so many more I cannot recall. You may not know these names, but they were the families that made Water Island what it is today!!!!!!! Norm passed away in November 1990 at age 66. Norm was orphaned at about age 9 in Massachusetts, he grew up with his beloved uncle Byron, volunteered for the Army Air Corp in WW II as a radioman and gunner on a bomber. He was shot down in the Pacific and rescued by an airboat, and returned to live and raise a family of four children (Chuck, Sue, Leigh and Chip) in New England. Norm was thrilled to move to Water Island in 1979. He loved every moment of it!!! Brave woman that Lucy is, she continued to live alone on Water Island and enjoyed friendships with the new crop of Water Islanders. Relying on her friends and especially Charles Pemberton for help, she lived here alone until 1997 when Chuck and Linda moved in and began their life here on the island. 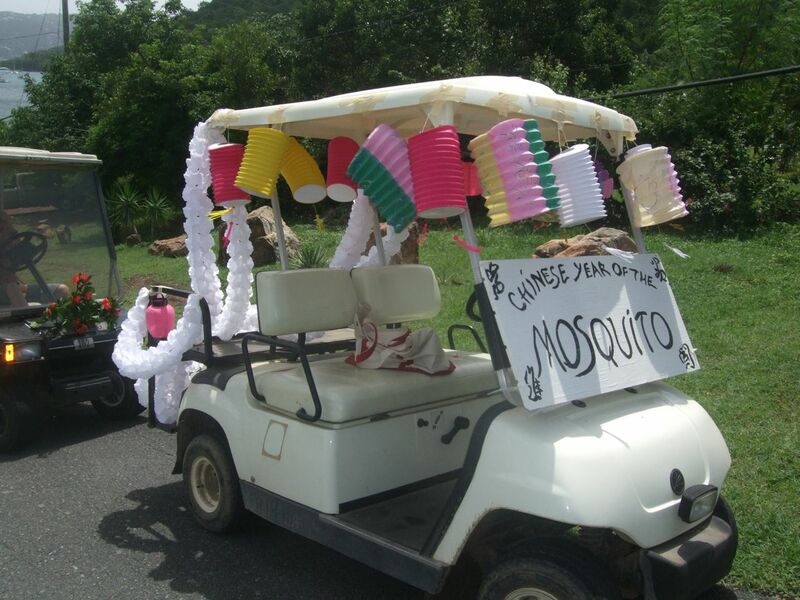 Lucy enjoyed the drive-in movie, bingo, going for lunch in town, going shopping and roaming around on St Thomas and Tortola with Jackie Coleman, participating in the St Thomas Orchid Society, and just being a part of the unique Water Island community. Her lifelong dream came true about 4 years ago when she traveled with her sisters to China. We hope to have her back for a visit, but if not, please remember the gentle lady that never had a harsh word about anyone, loved Water Island more than you know, and exhibited the old school charm and grace of Water Island in the early years. Lucy, thank you VERY MUCH for helping to make Water Island a true paradise! Posted March 29, 2011 The paving crew is back on island to erect guardrails near the 4 corners intersection at the dump road. 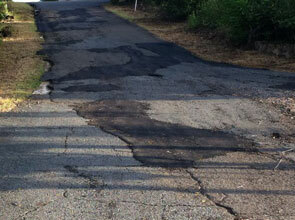 The foreman said that they would do driveway paving if owners contacted them. If you want private paving done please see the foreman at the site or contact Chuck Gidley. SLOW DOWN! SLOW DOWN! SLOW DOWN! Posted March 27, 2011 Be careful. Don't let this happen to you. 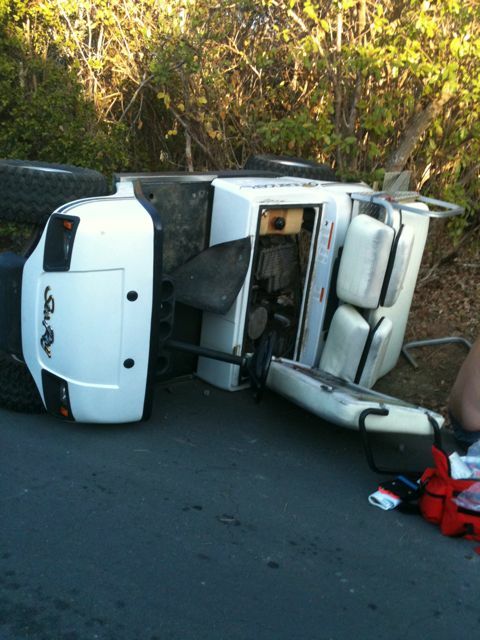 Four people injured, one of them seriously. WISAR did a great job! Posted March 24, 2011 A word of caution for all boaters traveling to Crown Bay in the morning. . . . . With the time change recently, a number of Cruise Ships are arriving later when local boaters are traveling to and from Water Island. Remember, the Cruise Ships cannot stop on a dime. For your own safety and those of any passengers you might have on board, give the Cruise Ships a very wide berth. Douglas Howard Barnes was born October 16, 1916, and died in his sleep on March 13, 2011. Mr. Barnes was graduated in 1938 from Lehigh University with a degree in Electrical Engineering. He had an accomplished career with Bell Laboratories of AT&T in New Jersey, where his design team saw the invention and worldwide installation of the rotary telephone. In 1991 Douglas retired, and, following the death of his wife, Blanche in 1992, Douglas moved to St. Thomas, US Virgin Islands. 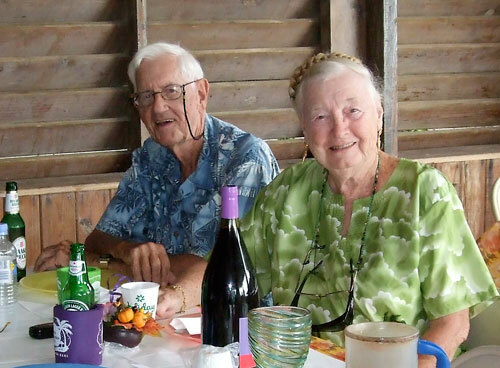 While in St. Thomas Douglas met and married Genevieve Alexander on Honeymoon Beach, Water Island, US Virgin Islands. Douglas was an avid deep sea boater and fisherman, and an active member of the US Power Squadron in both New Jersey and the Virgin Islands. Douglas Barnes is survived by his sister, Priscilla Bingham, two daughters, Kathleen Scott of Milford, Massachusetts and Linda Robinson of Ashburn, Virginia, three grandchildren, Douglas Scott, Theresa Robinson and Cheri Catlin, and four great grandchildren, Rowan and Devon Scott, Ella Catlin and Marcus Robinson. Memorial services will be held at 4 p.m. Tuesday, Faith Lutheran Church, 7525 West Markham, Little Rock, Arkansas. Genevieve, our thoughts and prayers are with you. Going Once! Going Twice! Gone! 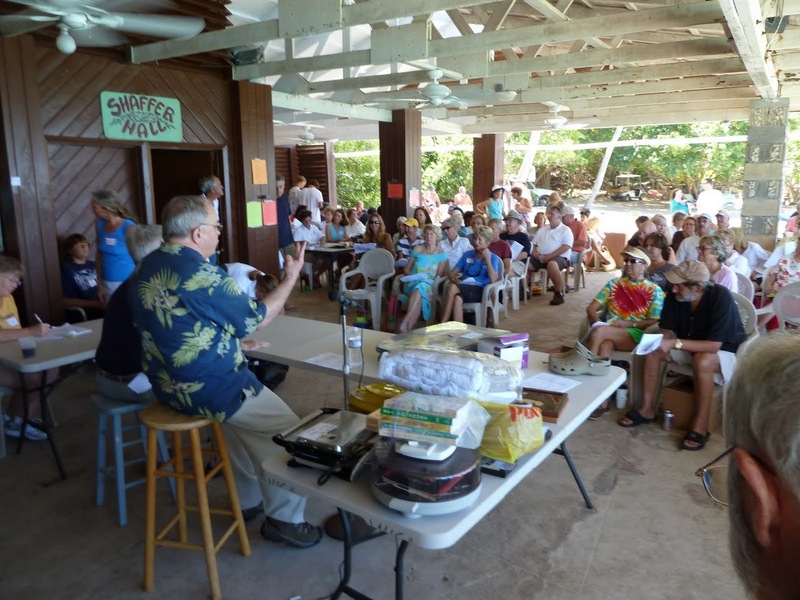 Posted February 21, 2011 The 25th Annual Water Island Auction held this past Saturday was a huge success! So many residents, visitors and folks from St. Thomas came out to enjoy the day on Honeymoon Beach. 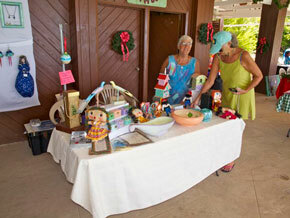 The array of items to sell was varied so there was really something for everyone. 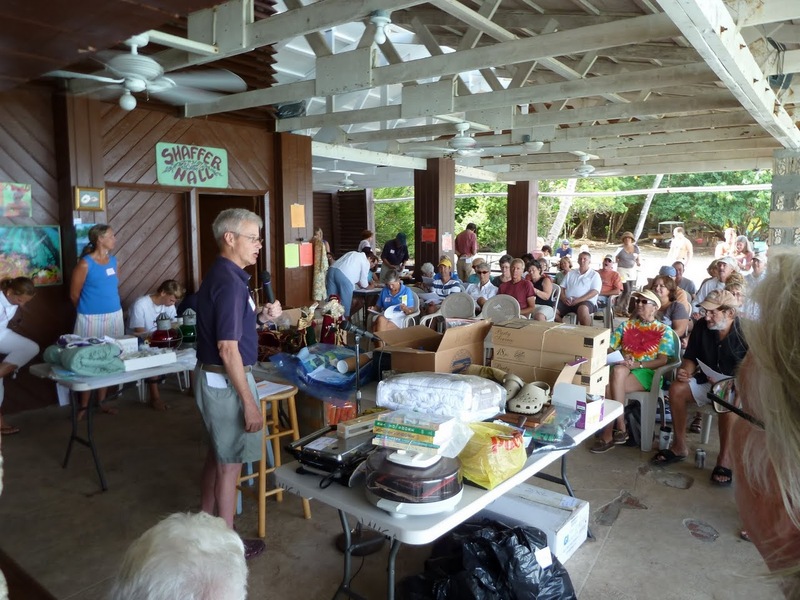 Many thanks go out to all of the auction staff, whether helping with collecting items for sale, printing up the flyers, helping set up and clean up and of course tending to the food and bar, everyone pitched in and made the day go smoothly. Our auctioneer Lee Shaffer did an excellent job with the help of fellow auctioneer Bill Kurtz, who was visiting Water Island with his wife Sharon. Thanks to them both for helping make the most of the day. Shaffer Hall Gets A Facelift! Posted February 13, 2011 WICA volunteers met Saturday morning at the Honeymoon Beach pavilion to start giving Shaffer Hall a "Facelift" with a fresh coat of paint! 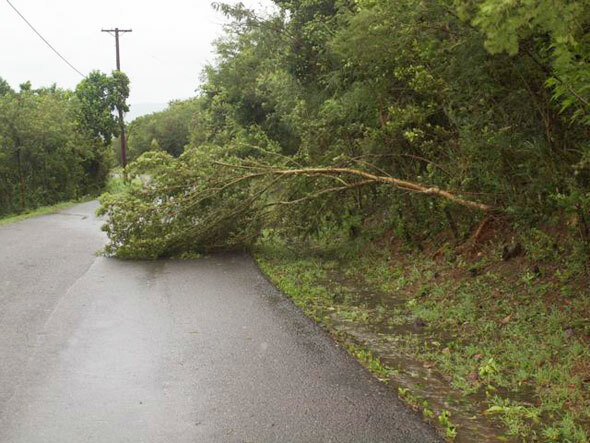 The U.S. Virgin Islands Housing, Parks & Recreation Department Commissioner, Mr. St. Clair Williams, supplied the materials and the Water Island Civic Association provided the workforce. A true cooperative effort between the two organizations. The effort was spearheaded by WICA President, Ray Lopez. A Big "THANK YOU!" to everyone that volunteered. To see a gallery of photos from the day click here. Posted February 1, 2011 WICA Members can check out the unapproved 2011 Annual Meeting Minutes that have been posted in the "Members" section. Posted January 31, 2011 The 6th annual Water Island Classical Music Festival is coming up on February 11, 12, and 13, 2011. Carnegie Hall Pianist Julian Gargiulo returns for the sixth year bringing to the Virgin Islands a performance of the program he played in January at New York's Carnegie Hall. 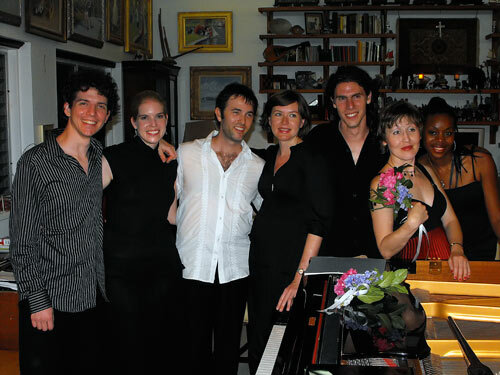 Joining Julian are six world class musicians including Chairman of the piano faculty at Peabody Conservatory, Boris Slutsky, former lead trumpet for the Canadian Brass, Joe Burgstaller, jazz pianist and composer Wells Hanley, jazz singer Patrice Perry, Russian pianist Maria Yefimova, operatic soprano Roza Tulyaganova of Uzbekistan, and Canadian violin virtuoso Marie-Ève Poupart. Seven musicians in three concerts; each evening will feature a totally different program of music. Make plans to come to be there! The concerts are free and plan to bring a donation to cover the artist’s expenses. Due to the demand for seating, indoor seats will ONLY be available to persons holding a (free) indoor seating ticket. 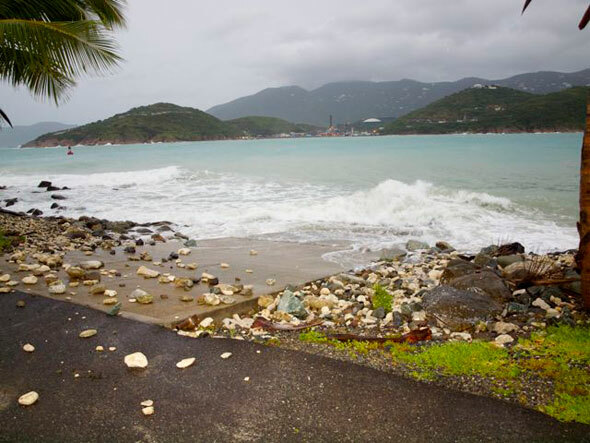 There will be ferry service from St. Thomas from Crown Bay Marina and return ferry boats to bring you back. Three nights, three concerts. Friday, Saturday and Sunday February 11, 12, and 13 at 7:00 PM to 10:00 PM at Providence Point Water Island. 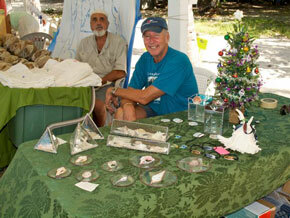 The concerts are sponsored by the Randall Family of Water Island who utilize their home as the concert venue. A ferry from Crown Bay Marina will be available at 6:30 and 6:45 to meet the concert and a return at 10:00 PM and 10:30. For more information call 774-2635 in the evening. On January 22, 2011 (the day of the WICA Annual Meeting), the Daily News announced that District Judge Gomez lifted the injunction freezing VI property tax values and rates at the 1998 level. The decision in summary provided that (1) the 1998 property values and rates shall continue for the 2007, 2008 and 2009 tax years, (2) the new tax rate structure will be used for the 2010 tax year property tax bill to be issued in 2012, and (3) taxpayers will receive two years back tax bills each year until the bills are current. Specifically, the 2007 tax bill will be issued in February 2011 (using the 1998 property values and tax rate). The 2008 tax bills will be issued the summer of 2011 (also at the 1998 rate). The 2009 tax bill will be sent out in 2012 (using the 1998 values and rates). The 2010 tax bill will also be sent out in 2012 using the updated property values and the new tax rate. You can read the entire article by clicking on the Daily News article below. We are sure you have many questions. Updates will be posted on this site as we gather more information.